The new Cat® MD6200 Rotary Blasthole Drill is designed as a production drill with the flexibility to do pre-split drilling – all in a package that is Caterpillar’s most transportable rotary drill yet. The versatile MD6200 is designed to perform rotary or DTH drilling in single-pass or multi-pass modes and can drill holes of 127 - 200 mm (5 - 7.87 in.) dia. The MD6200 offers the ability to drill at a negative angle up to 15°, which enables matching the slope of the highwall for pre-split drilling. The result is cleaner highwalls with less waste material going to downstream operations. For traditional production drilling, the mast can tilt from vertical out to 30°. The operator can adjust the mast angle in increments of 5° from the touch screen in the cab – with no special setup required. The drill also offers best-in-class manoeuvrability. Its compact working envelope and powerful undercarriage get it into position faster, reducing the time spent accessing drill patterns and moving between holes. The Cat 336 excavator-style undercarriage provides superior durability, tractive effort and drawbar pull. 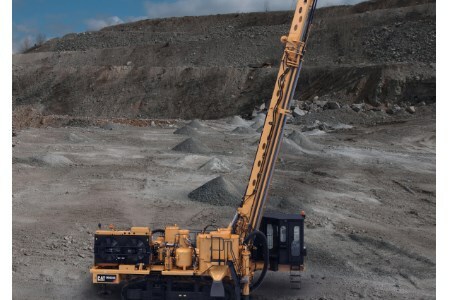 A Cat C18 engine powers the drill and is rated to meet the needs of any mine site. It is available in US EPA Tier 4 Final configuration and in US EPA Tier 2 equivalent configuration to suit regional needs. The Cat powertrain delivers high efficiency and reliability. Both high pressure and low pressure compressor configurations offer variable volume air control, perfectly matching the compressor output to the drill tool and application needs. The system also lowers stand-by pressures while the machine is idle, further improving fuel efficiency. Cat technology options make the MD6200 even more productive and efficient. Drill Assist offers a number of automated functions, including auto level, auto retract jacks, auto raise and lower mast, and auto drill. The drill depth monitoring system helps to reduce over- and under-drilling – to optimise productivity and fragmentation.